The beefsteak tomato is one of the largest tomato cultivars, with some varieties weighing in at over 2 pounds per tomato. 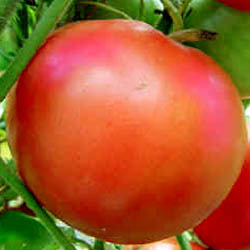 Rather than maintaining a perfectly spherical shape as it develops, the beefsteak tomato takes on a decided kidney-bean shape, spreading out to the sides. Also known as Red Ponderosa or Crimson Cushion. Produces huge, delicious, ribbed fruit on vigorous vines.